Chic and elegant, Anne Namba stood before the gathering at the Omni Hotel on June 7 in a dramatic crimson and gold gown and matching jacket, created from her signature vintage kimono fabrics. 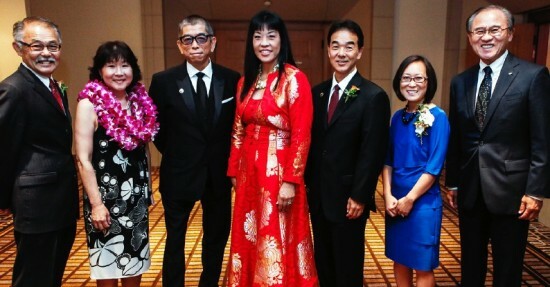 This year the Japanese American Cultural and Community Center recognized the achievement of Japanese American fashion designers at its 34th annual anniversary celebration. Namba has risen in the fashion world from working in the costume department at Radio City Music Hall to creating her own successful fashion line with clients including Elizabeth Taylor, Mariska Hargitay and Kirsti Yamaguchi. 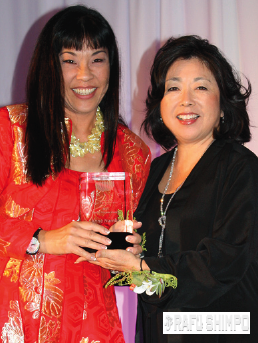 Namba said she was proud to be Japanese American and the first recipient of the award from Hawaii. “Growing up my father used to say when you are able, give back to your community because your community will support you,” Namba stated. Tadashi Shoji in a sleek black suit said it was his desire to remain in the United States that led to his ascendance in the fashion industry. 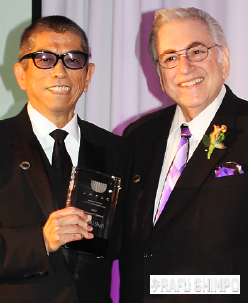 Joel Friedman, CEO of Mikawaya USA, presented Shoji the JACCC Chairman’s Award. Since launching his own collection in 1982, Shoji has steadily grown his brand, now featured in over 4,000 major department and specialty stores worldwide. Shoji’s gowns have been worn at the Academy Awards and the Tournament of Roses Parade, but he also remains a big supporter of the JA community as the official designer for the Nisei Week Court. “I’m very lucky, this is the American dream,” he said. Victor Fukuhara, Nancy Kikuchi and Michael Okamura received the third annual Community Spirit Award, given to unsung heroes in the Nikkei community. Fukuhara is an active member of the Long Beach Japanese American community. He is involved with the Long Beach-Yokkaichi Sister City Association, Long Beach Historical Society, Nanka Yamaguchi Kenjinkai and Kokoro Kai, among other organizations. A longtime teacher of taiko, his Okedo drum was featured at an exhibition at the Japanese American National Museum. Kikuchi is the cofounder of the JET Alumni Association of Southern California and is a longtime volunteer for organizations including the Ehime Kenjikai of Southern California, Little Tokyo Koban, Tofu Festival, Nisei Week Foundation, Japanese Restaurant Association, L.A. Beat, Japanese Chamber of Commerce of Southern California, Japan America Society and Habitat for Humanity. She is currently employed by Upper Crust Enterprises. Okamura is in his third term as president of the Little Tokyo Historical Society. He is a 25-year volunteer at JANM and also volunteers with the Montebello-Ashiya Sister City Association, Nisei Week, Manzanar National Historic Site, USC First Generation College Student Mentor Program and as a Sunday school teacher at Altadena Community Church, United Church of Christ. “Finally to the JACCC, the three of us humbly accept this award and are proud to be your 2014 Community Spirit awardees, domo arigato gozaimasu,” Kikuchi said. 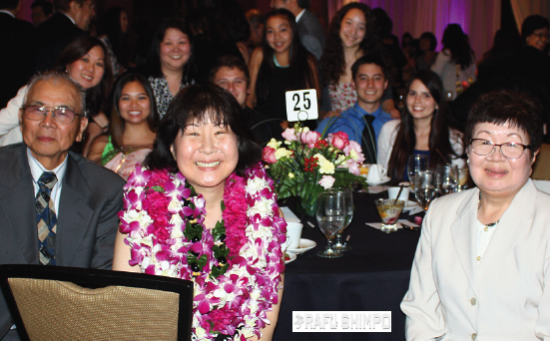 More than 500 attended the anniversary dinner, which is a fundraiser for the JACCC. Founded in 1971, the JACCC has been a center for multi-generational cultural and community programs for Japanese Americans in Little Tokyo. It is home to 18 civic, business, cultural and arts organizations. Henry Ota, chairman of the JACCC board of directors, introduced five new board members: Kanako Yokoi Chung, Glenn Inanaga, Daren Mooko, Tony Nobuyuki and Craig Tomiyoshi. “As an older Sansei, if one could be excited about the future of an organization, I’m very excited about what’s going on at the JACCC. We’re so lucky to have such a dedicated leader like Leslie Ito and these young board members that I just introduced to you,” said Ota. “JACCC is not here for an older Sansei like myself, it is here for our kids, grandkids and future generations of offspring.